With so many possible college bracket combinations, all those blank spaces can be daunting to fill in. 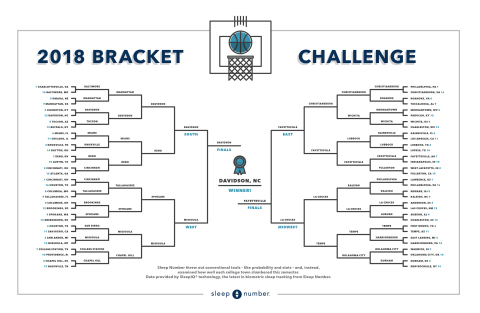 This year, Sleep Number offers college basketball fans a new way to complete their 2018 college basketball brackets. Sleep Number threw out conventional tools – like probability and stats – and, instead, examined how well each city slumbered this semester. Add in some fancy analytics, and the result is a bracket prediction based on which college towns slept the best, which is a leading indicator of athletic performance. So, go ahead: copy this perfect basketball tournament bracket, which may just help you win your pool. Or, more than likely, you’ll just sleep better knowing you have the body’s most essential need for peak performance – sleep – informing this year’s selection. See accompanying graphic for details on how we think this dance will end. SleepIQ® technology is integrated into Sleep Number 360® smart beds to track a person’s sleep, offer insights and make suggestions for achieving a great night of sleep. The SleepIQ technology platform powers one of the most comprehensive databases of biometric consumer sleep data in the world. Each night, SleepIQ technology seamlessly reads hundreds of measurements per second, tracks hundreds of thousands of sleep sessions, and analyzes over 4 billion biometric data points. Each morning, SleepIQ users receive a SleepIQ® score that reflects the quality of their rest.